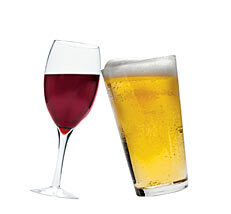 Is reducing the tax on beer but not wine legal under EU law? Cheaper beer but is it legal? Delivering the budget today Chancellor George Osborne announced the reduction in beer duty by 1p per pint. However he did not do the same for wine. We have been wondering if the Treasury has cleared this with their lawyers as this could potentially infringe EU law – a point raised by Geoffrey Clifton-Brown MP in the debate. Hopefully it is legal but we thought we might remind them of an old case. Under EU law you can not discriminate against another state’s products. As the UK does not produce (much) wine the EU could argue that this breaks EU law. They have done it once before. 1 . DECLARES THAT , BY LEVYING EXCISE DUTY ON STILL LIGHT WINES MADE FROM FRESH GRAPES AT A HIGHER RATE , IN RELATIVE TERMS , THAN ON BEER , THE UNITED KINGDOM OF GREAT BRITAIN AND NORTHERN IRELAND HAS FAILED TO FULFIL ITS OBLIGATIONS UNDER THE SECOND PARAGRAPH OF ARTICLE 95 OF THE EEC TREATY .